The 2005 AFL season was launched in Brisbane this year, and AFL CEO Andrew Demetriou was full of praise for AFL PNG. The organisation, responsible for an explosion in junior footy numbers in Papua New Guinea, has now formally come under the wing of AFL Queensland. The plaudits from Demetriou are the first for another country that we know from the top AFL official. The following report is from AFL PNG Director Justin Karcher. The 2005 AFL season was launched in Brisbane this year, the first time the launch has occurred outside Melbourne and the Master of Ceremonies was none other than AFL Queensland Ambassador Alestair Lynch. AFL PNG is now considered a part of AFL Qld and therefore our own AFL PNG Board member Justin Karcher was invited along to sit with AFL Qld representatives and AFL CEO Andrew Demetriou. Also at the AFL Qld table seated with Demetriou was AFL Queensland Chairman Darryl Bray, AFL Qld General Manager Richard Griffith, AFL PNG General Manager and Development Director Andrew Cadzow, AFL PNG Development officers Bob Batty and Dean McClare (Qld based), and JDA Wokman Executive Chairman and AFL PNG sponsor John Davidson. Demetriou only granted one "hearing" and AFL in PNG was the topic. This is a huge milestone in itself when you consider the Television rights to the 2005 and subsequent seasons was the hot topic and the press representatives outnumbered the invited guest to this gala AFL event! Demetriou acknowledged that PNG is a vital pool to the development of the game outside Australia and agrees that it is only a matter of a few years before a locally trained Papua New Guinean is playing in the AFL. In his own words "A tribute to the programs in place to guide AFL players in PNG as young as 6 through the development stages and prepare them for the AFL draft and Rookie selection." Apart from the praise received from the AFL CEO, Darryl Bray was quick to point out that AFL Qld considers the adoption of AFL PNG under the wing of AFL Qld to be a major coo for the game in Qld. He has been most impressed with all PNG representatives that have competed in various age group championships over the past 3 years and is excited about the talent his development officers are discovering in PNG. AFL PNG has a very exciting year ahead with the PNG Mosquito's hot favorite's to win the International Cup in Melbourne this coming August. This coupled with the attention AFL in PNG has received from the very top of the AFL tree makes for a very exciting future. 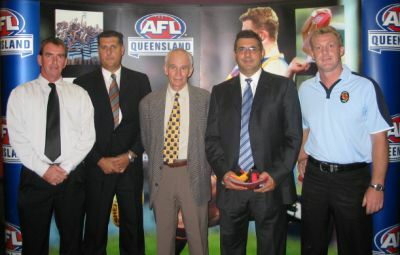 Pictured left to right are Andrew Cadzow (General Manager AFLPNG and Development Officer AFL Qld), Richard Griffith (AFL Qld General Manager), John Davidson (sponsor of AFLPNG), Andrew Demetriou and Justin Karcher.